Who says wedding season is only in the summer? Fall weddings are cooler, the colors are beautiful, and the pictures are absolutely stunning. Make your rustic fall wedding in Maryland truly magical with these 15 fall wedding ideas. From the décor to the catering, your wedding day should be special from start to finish. What better place to throw a party than in Edgewater, MD? Sandy beaches and parks are a dime a dozen, as well as beautiful private homes scattered along the Chesapeake Bay. No matter the event you are celebrating, (e.g., wedding, birthday, fundraiser, etc.) you can be sure to find the perfect venue to compliment it. Read on to learn about our favorite locations to throw a party in Edgewater. One of our recent catering events was a party that Governor Larry Hogan organized for his staff at the Government House. This is a private party that the Governor puts on each year for all of the employees and families that work at the mansion. The event was held on May 6th, 2017. Although we were not allowed to have a professional photographer on site, we were able to capture a few moments from the night ourselves. There is no doubt that American families are busy. Between school, work, and activities we barely have time to eat, let alone sit down to a meal together. 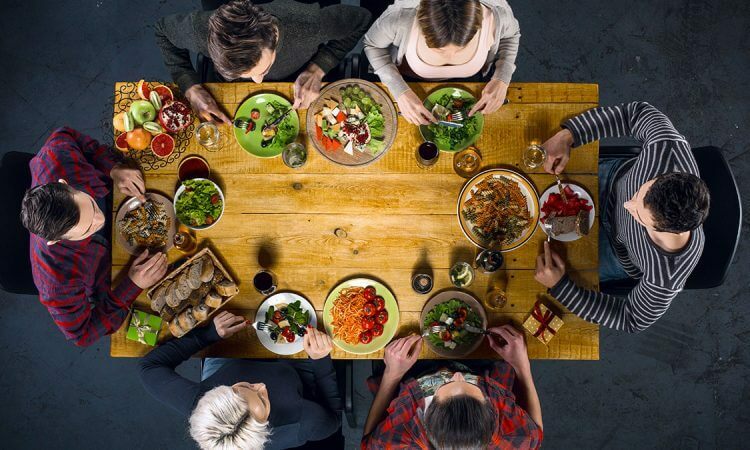 Try making the time for family dinner. There are many reported benefits from improves social skills to keeping kids safe.